OneAPPS offers Managed services tailored specifically to both custom Oracle technology and Oracle E-Business Suite Applications environments. 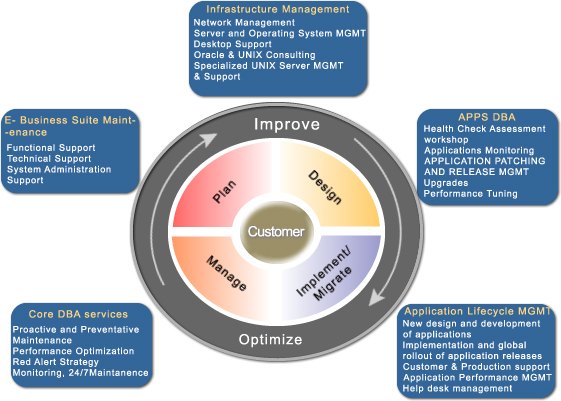 OneAPPS has established comprehensive Managed Service plans that provide support for the full Oracle software suite. Whether you need a complete support program or tools to equip your in-house staff OneAPPS has the service plan for you. You can utilize our Managed services to complement your in-house resources, or - as some clients prefer utilize our full Oracle outsourcing services for all your Oracle Infrastructure Assets. From E-Business Suite Applications management, including management of related database(s), to third party management of hardware and software vendors and service desk support, our comprehensive Managed Application Support solutions ensures the highest levels of application and end-user support possible. OneAPPS delivers a well defined, professional offering, backed by experienced professionals, a secure infrastructure and world class processes, making problem and task management a painless exercise. Our Managed services give you a low-risk, managed-cost solution for your IT infrastructure management that really delivers.